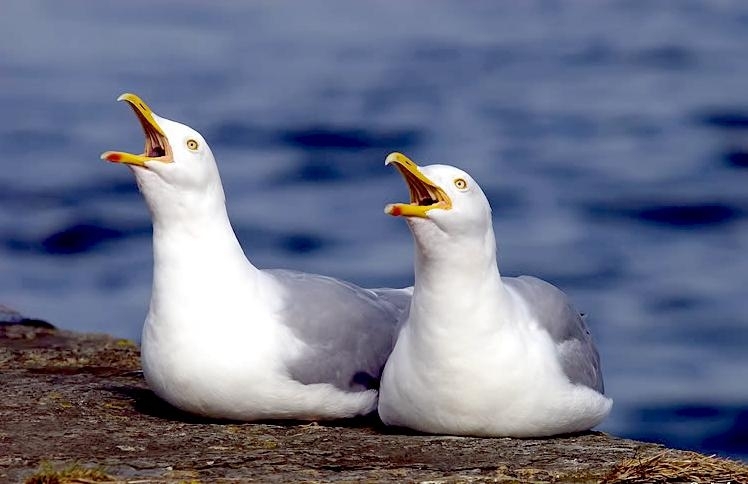 The well-known yodelling call of the Herring Gull conjures up pictures of the seaside perhaps more than any other sound. 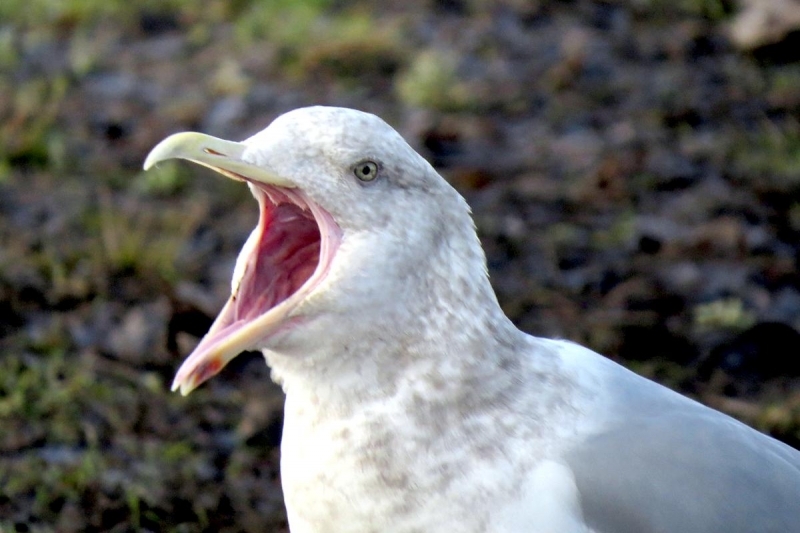 Herring Gull is not a particularly suitable name for this seabird for although it will eat Herrings, it will eat almost anything else. 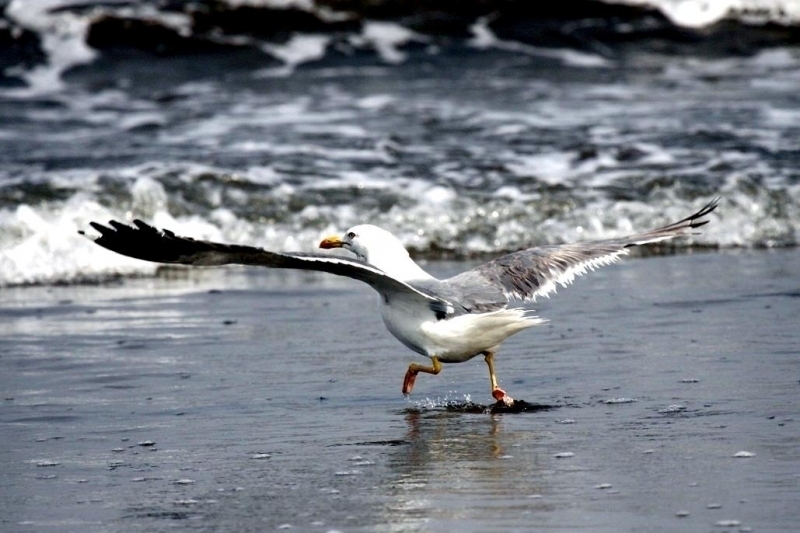 The Herring Gull has adapted very well to man’s way of life and is the main scavenger around rubbish dumps and fishing harbors. 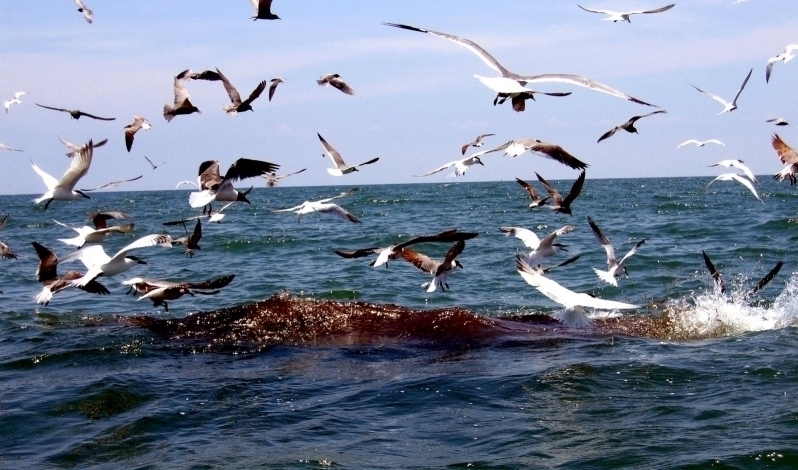 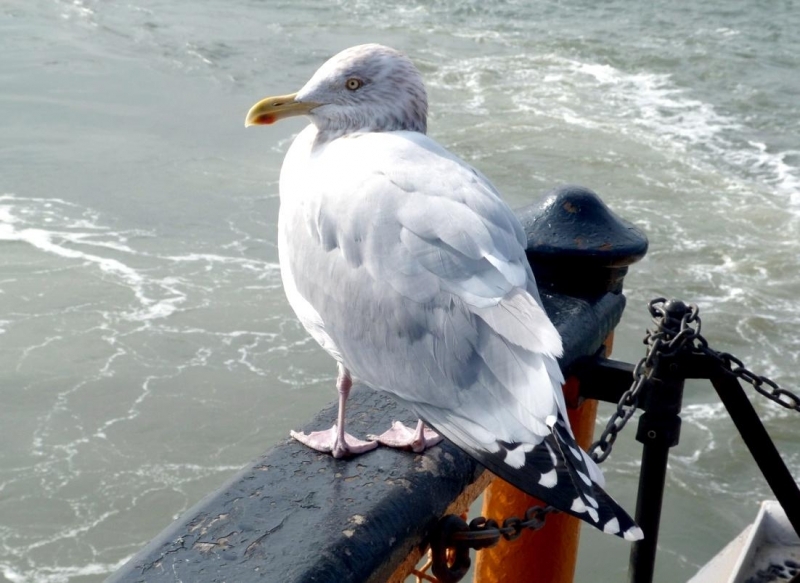 It seems to prefer to feed on these easy pickings rather than catch fish at sea. 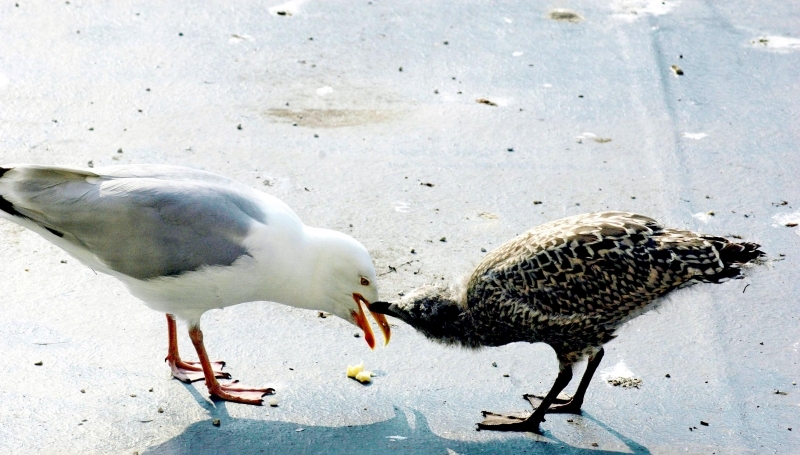 Herring Gulls are aggressive seabirds and will threaten other species with a fierce and intimidating display if they come too close. 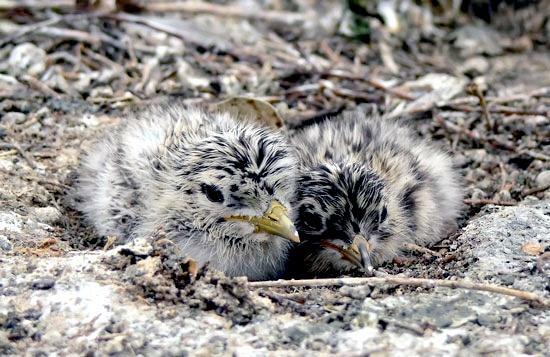 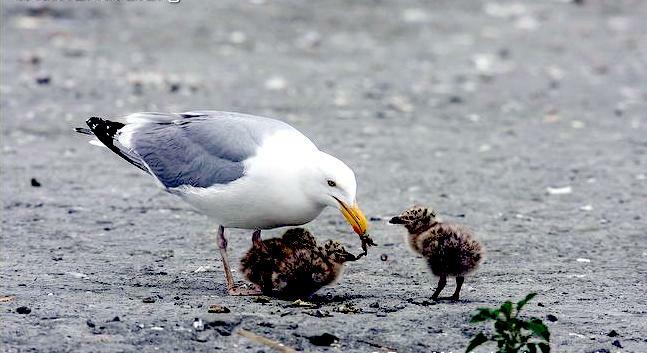 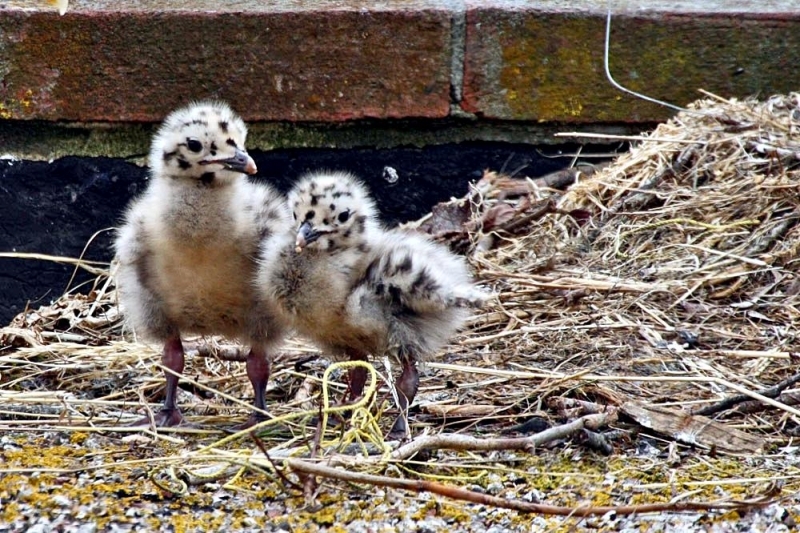 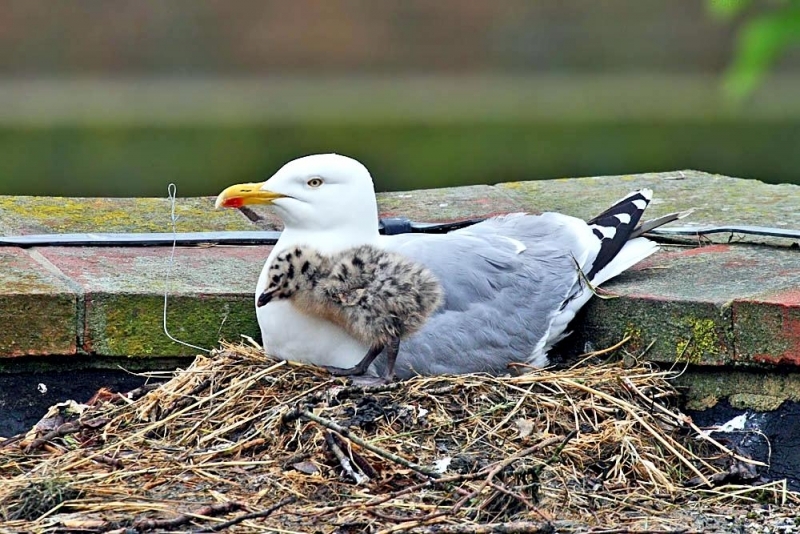 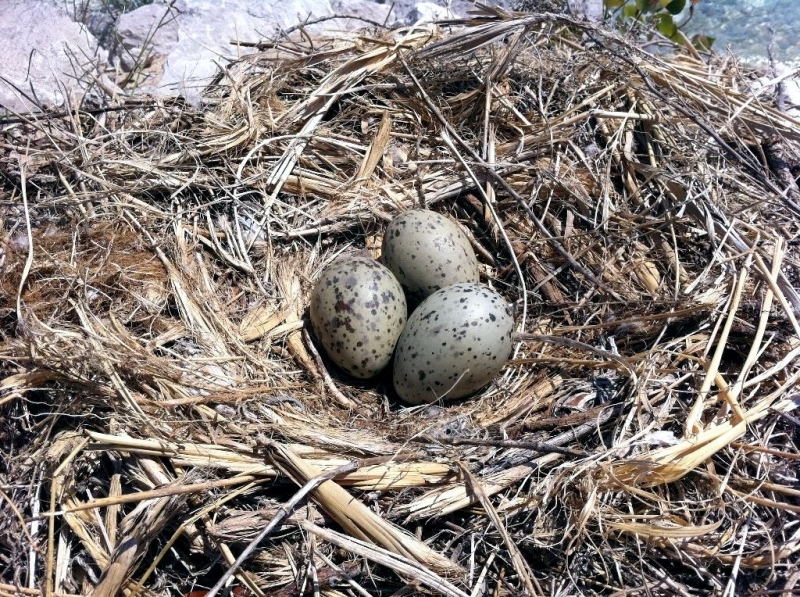 Herring Gulls nest in colonies mainly on rocky cliffs but also on dunes and even on buildings in coastal towns or cities. 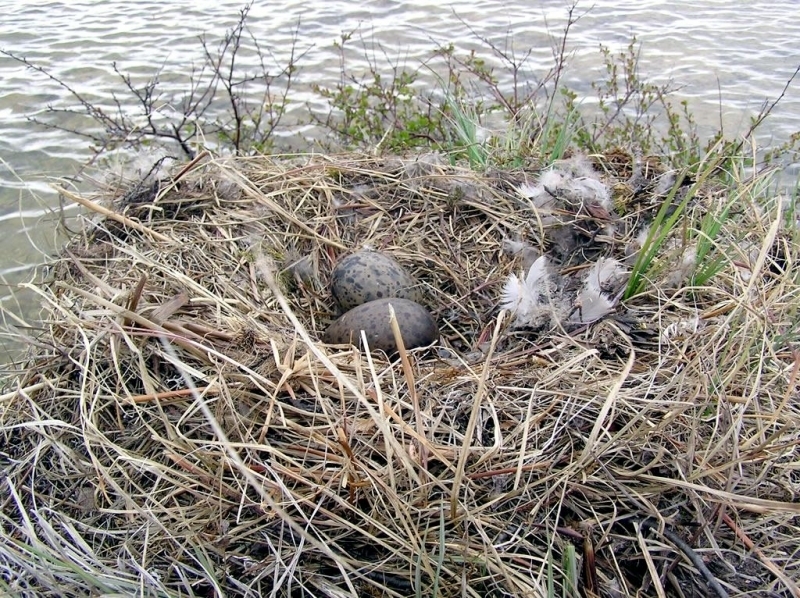 A large nest of seaweeds and grass is built, sometimes as early as February. 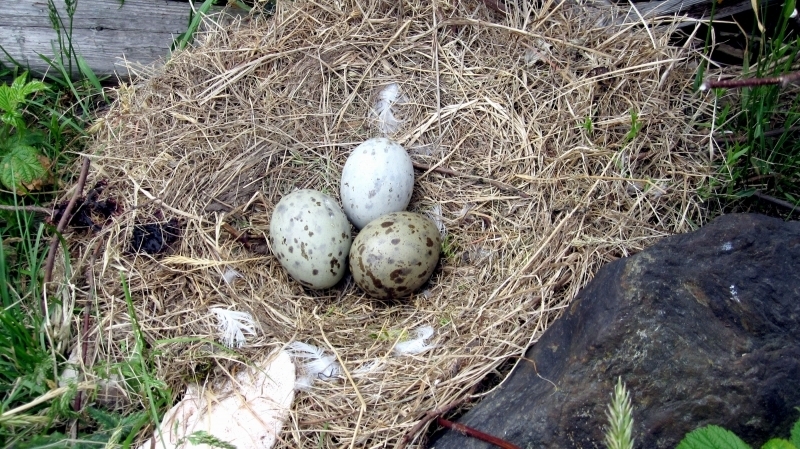 A single clutch of 2-4 eggs is laid but if these are lost more are laid. 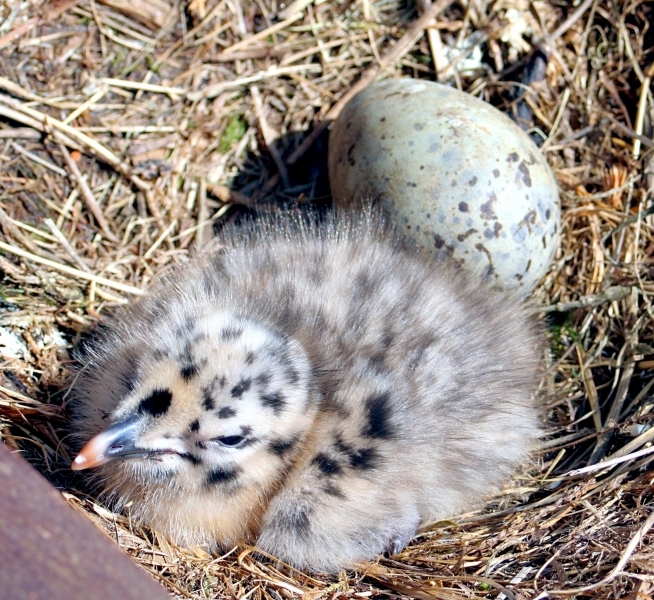 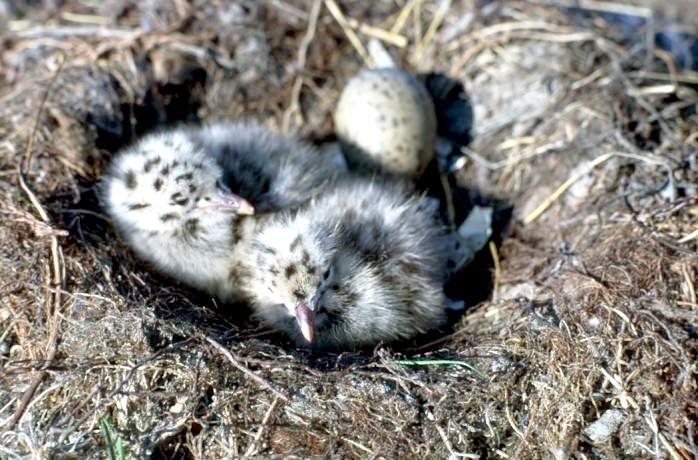 The eggs are laid on alternate days so that the young hatch at 2 day intervals. 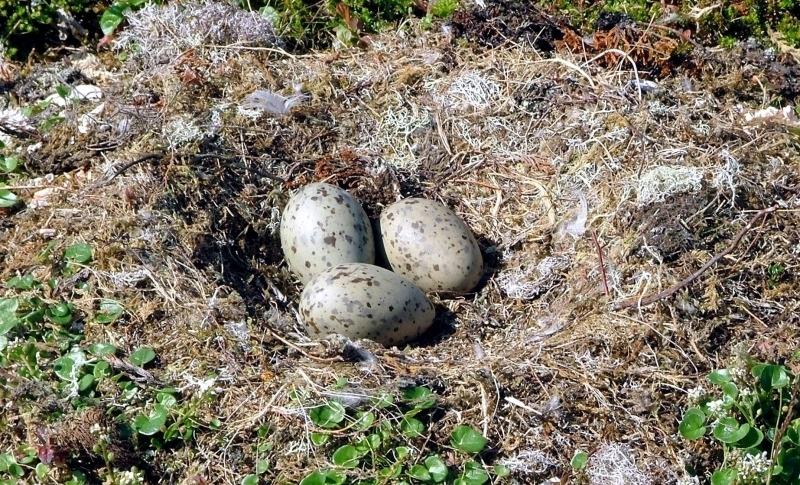 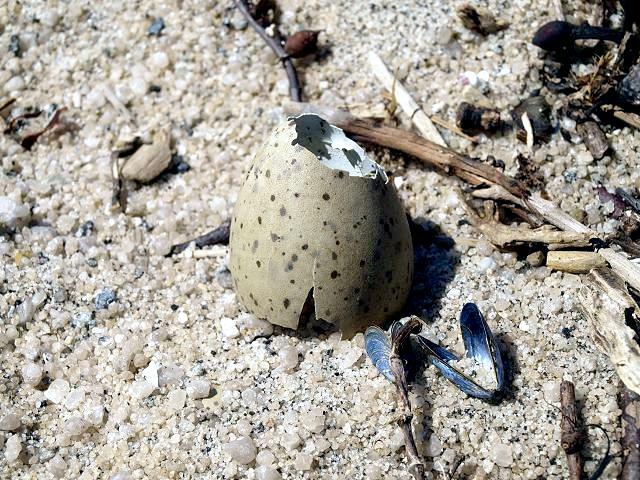 The eggs are incubated by both parents for 25-27 days. 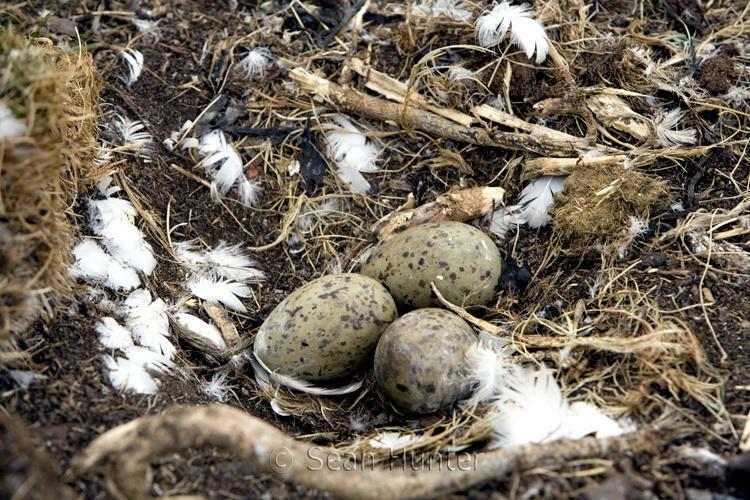 The chicks, which are covered in grey down with dark blotches, are fed by both parents on regurgitated food. 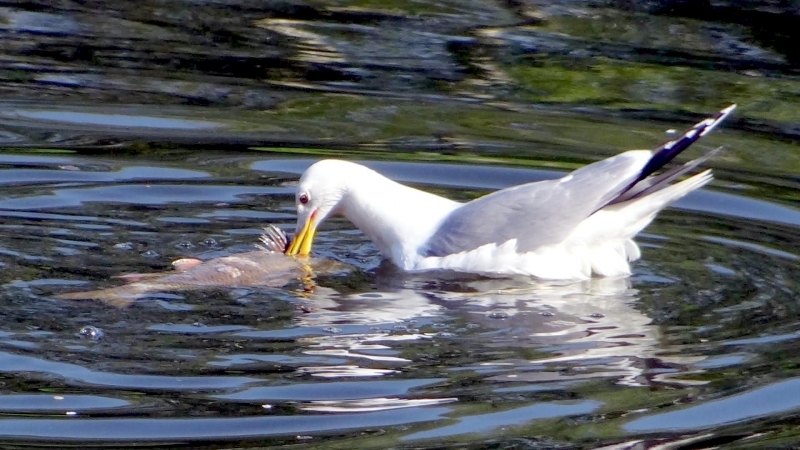 To obtain a meal, they peck at the red spot on the parent’s bill. 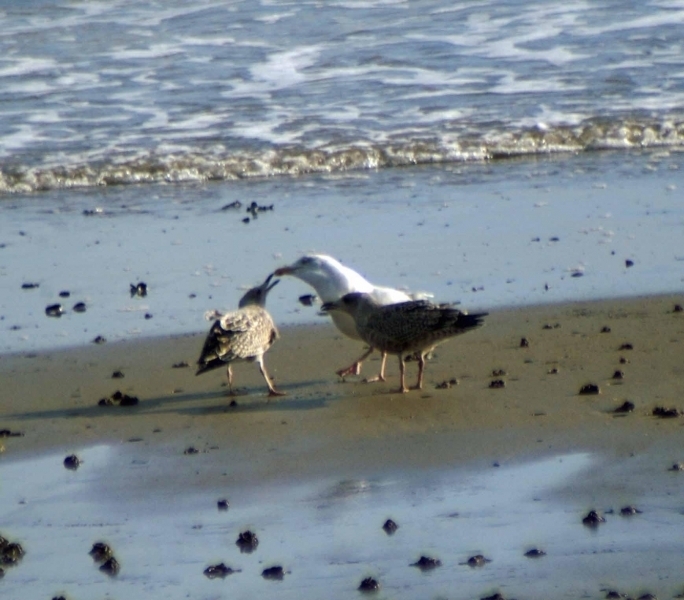 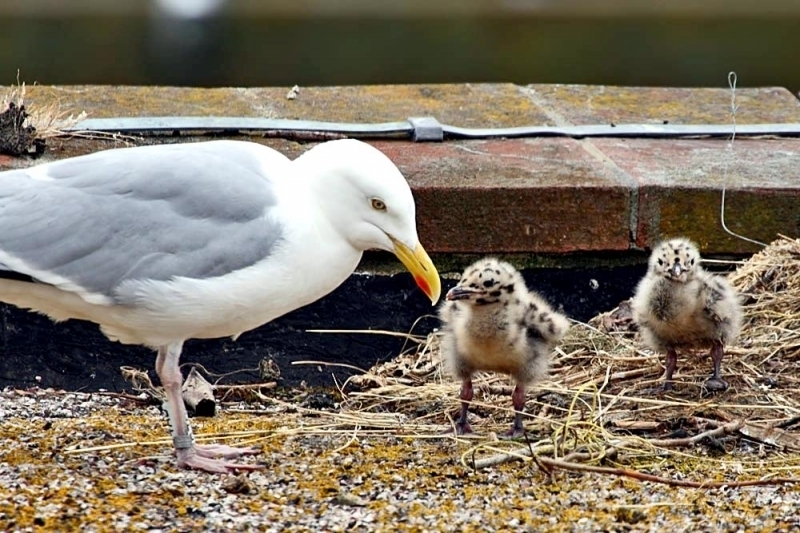 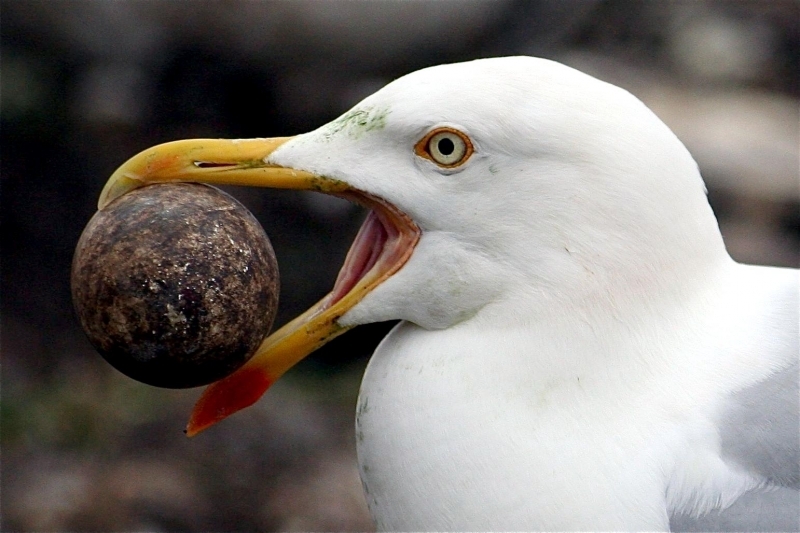 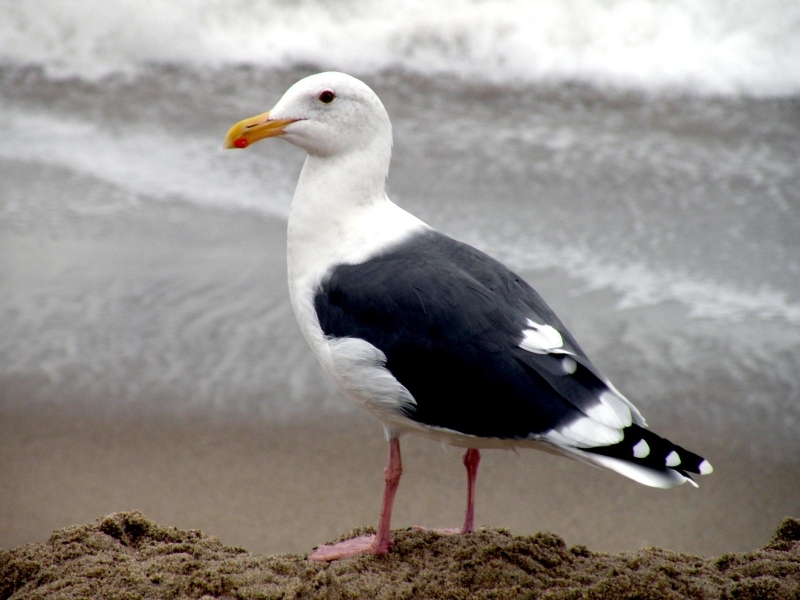 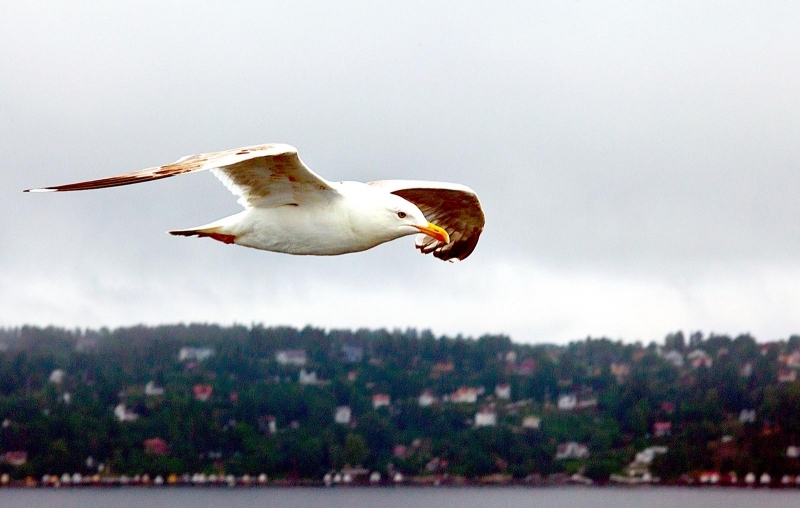 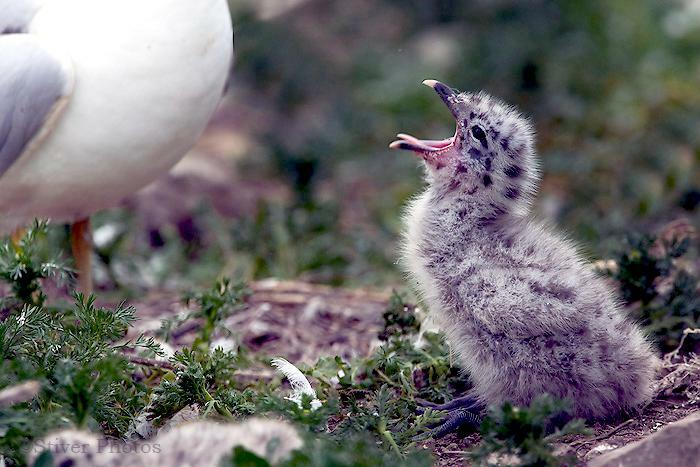 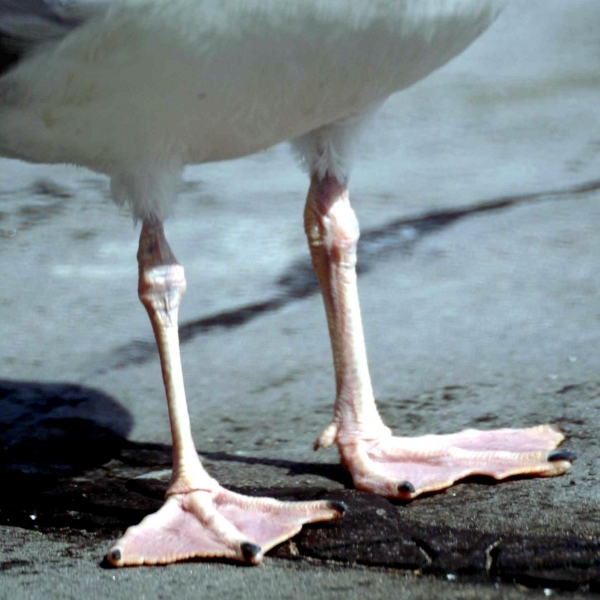 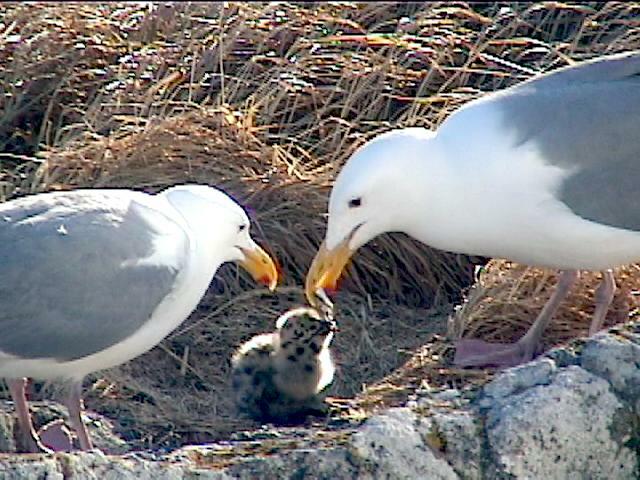 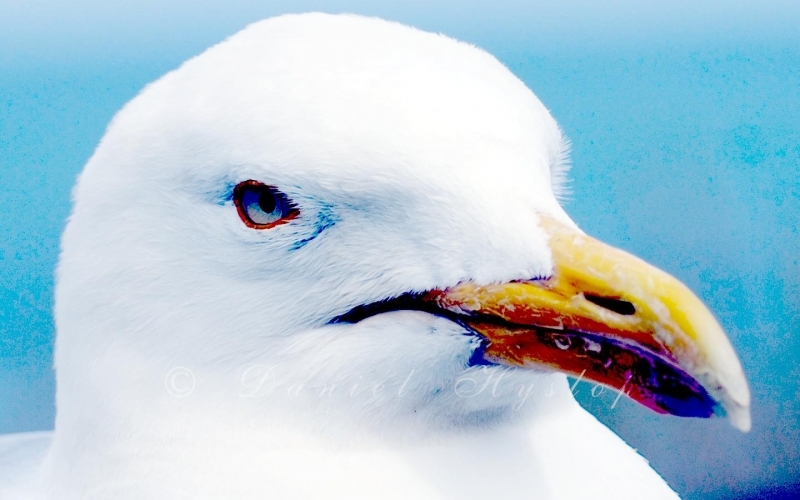 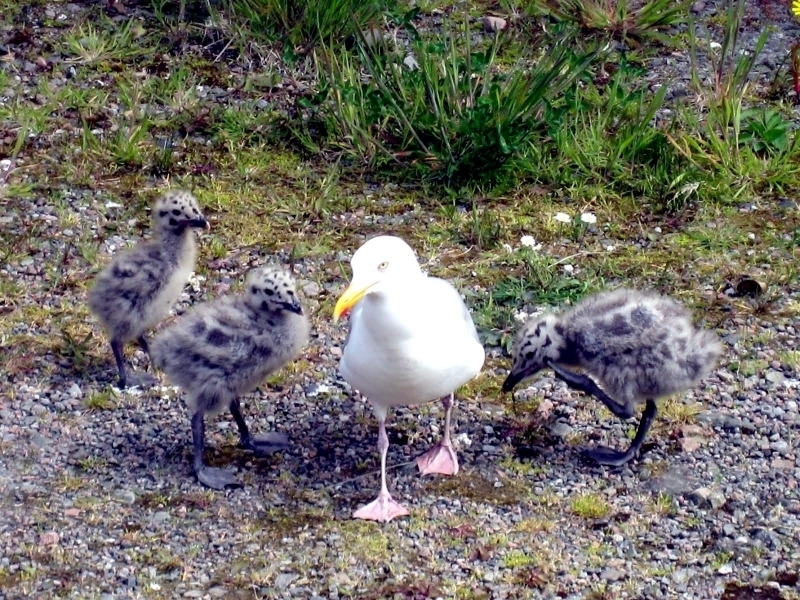 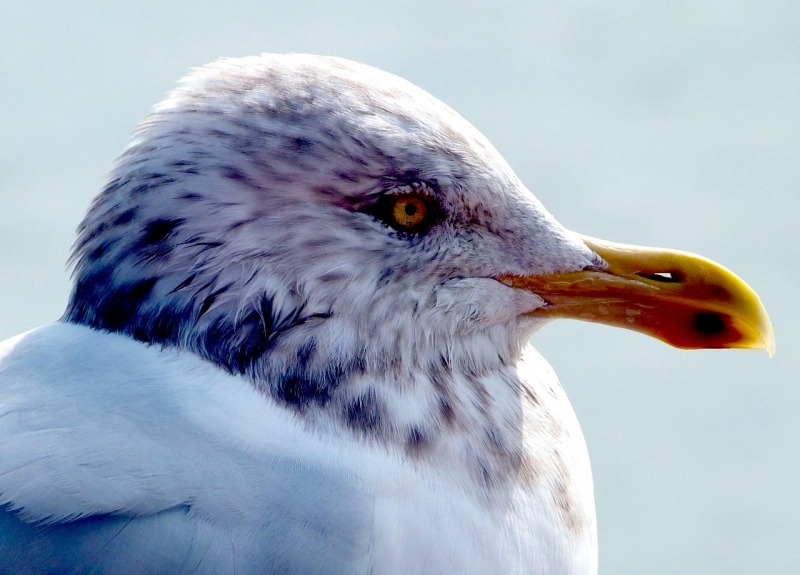 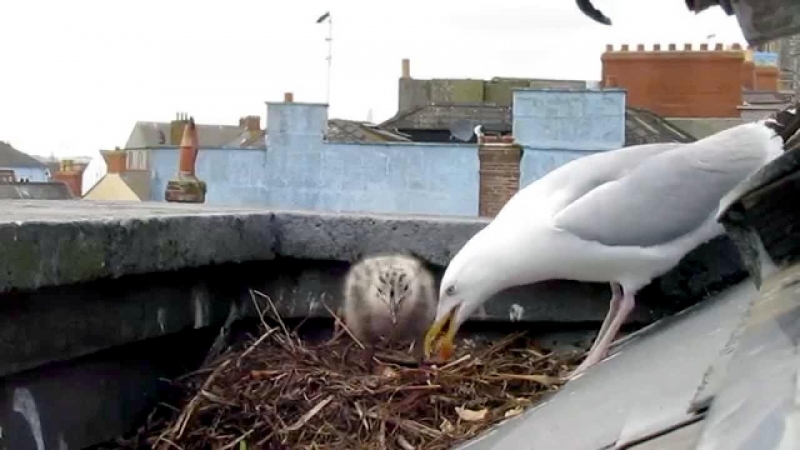 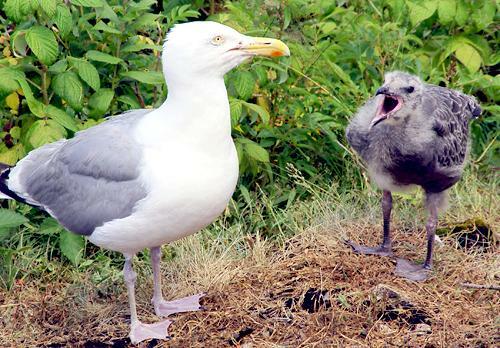 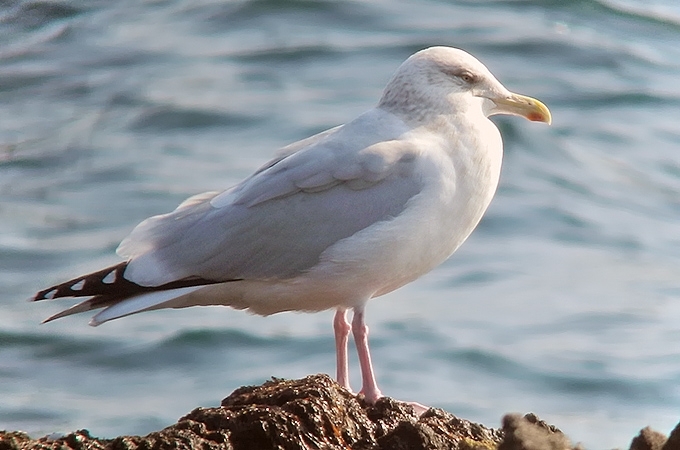 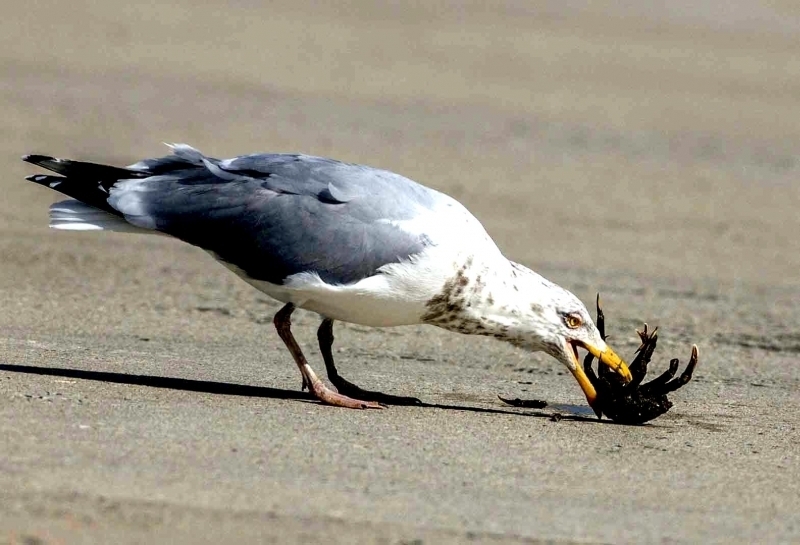 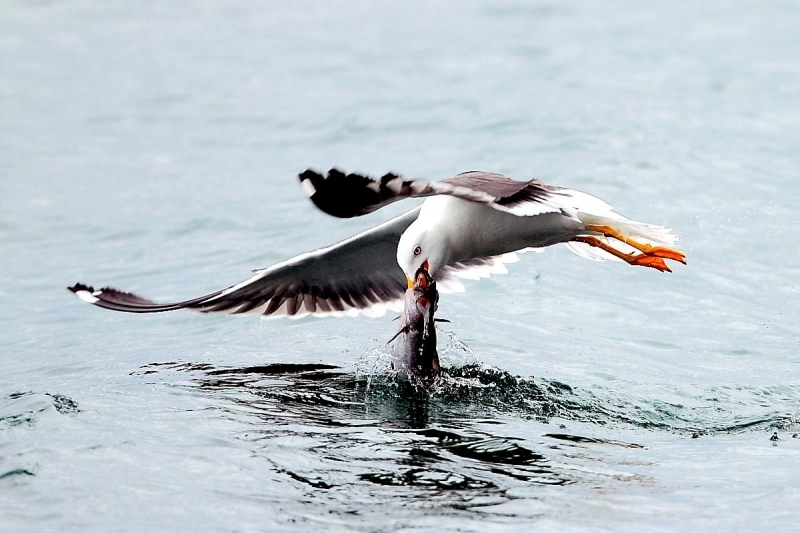 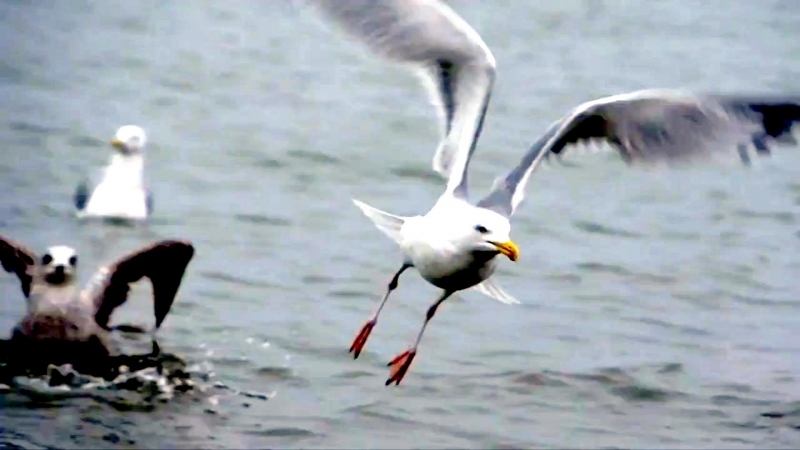 Studies have shown that Herring Gull which feed their young on food scavenged from fish docks breed more successfully than those which mainly fish at sea. 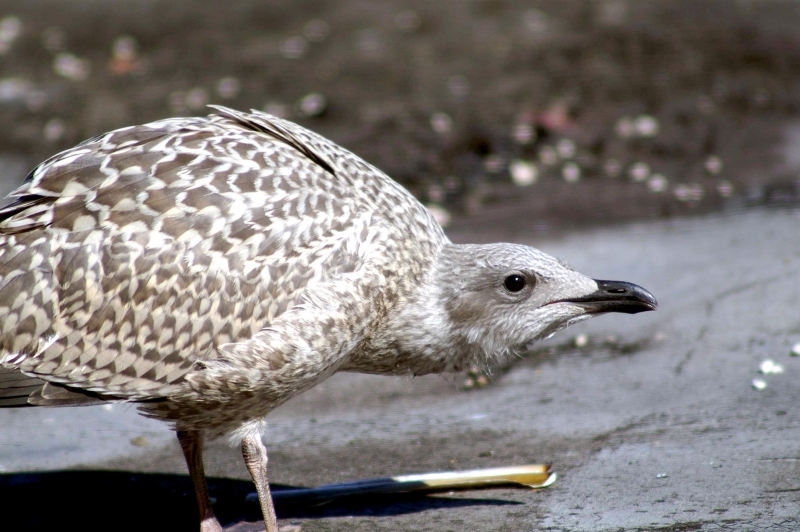 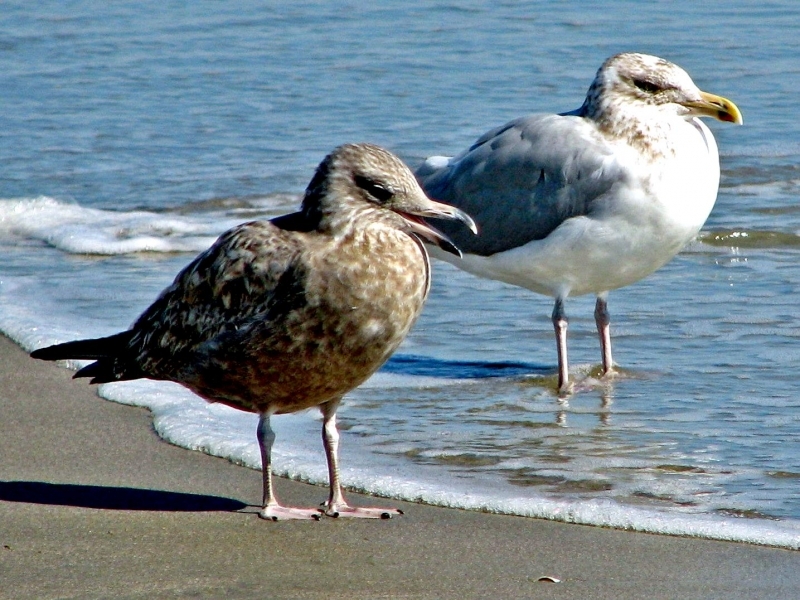 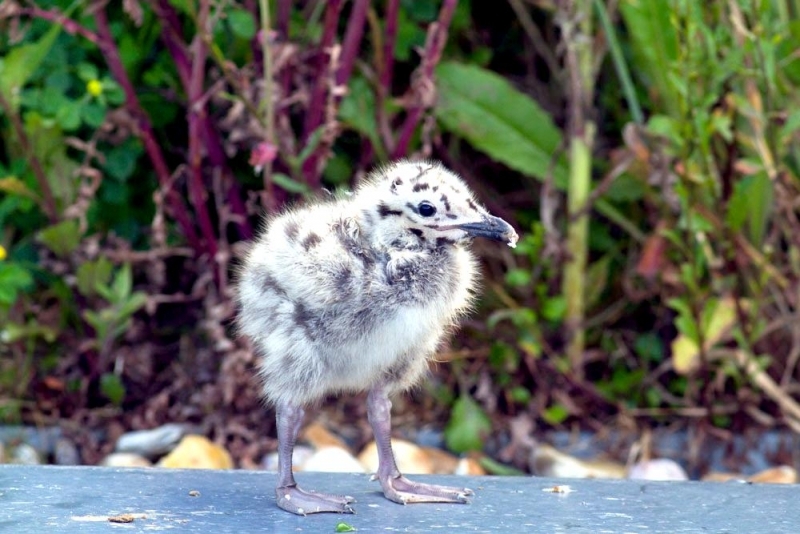 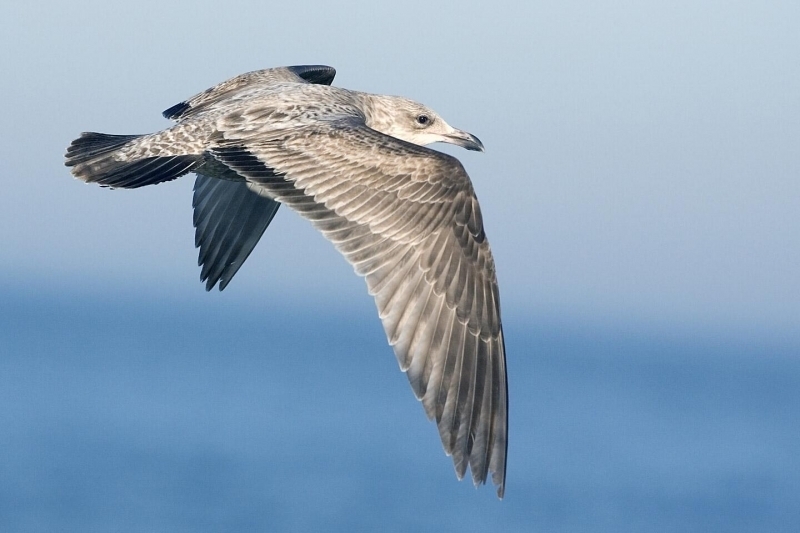 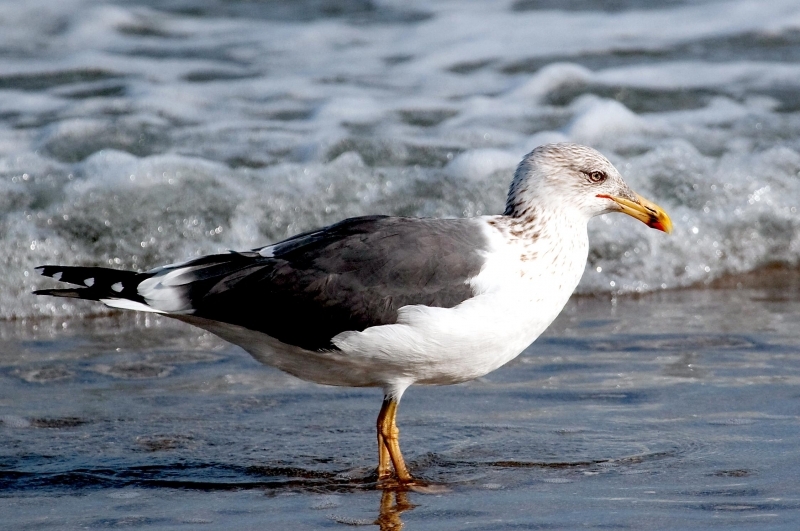 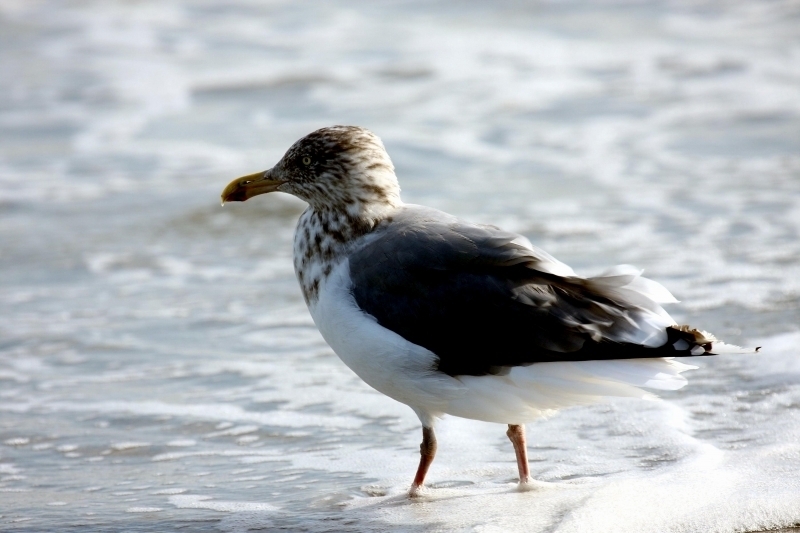 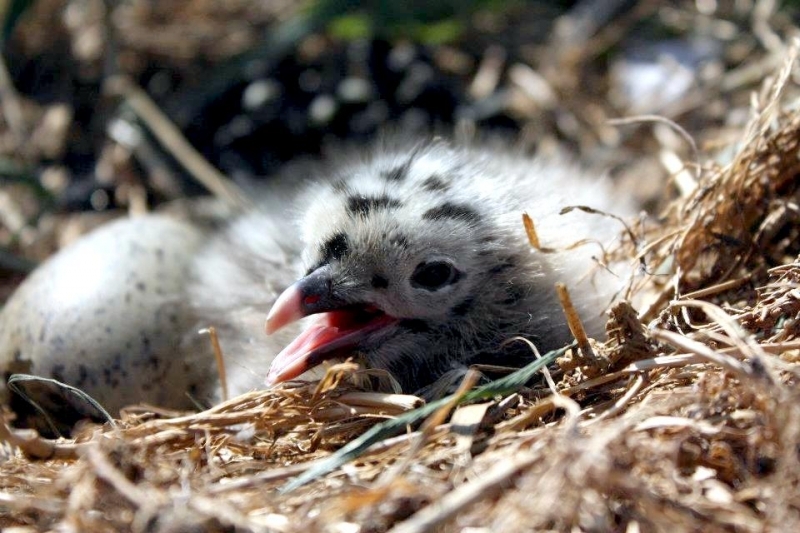 At 42 days of age, young Herring Gulls can fly and for the first year of their life their feathers are speckled brown. 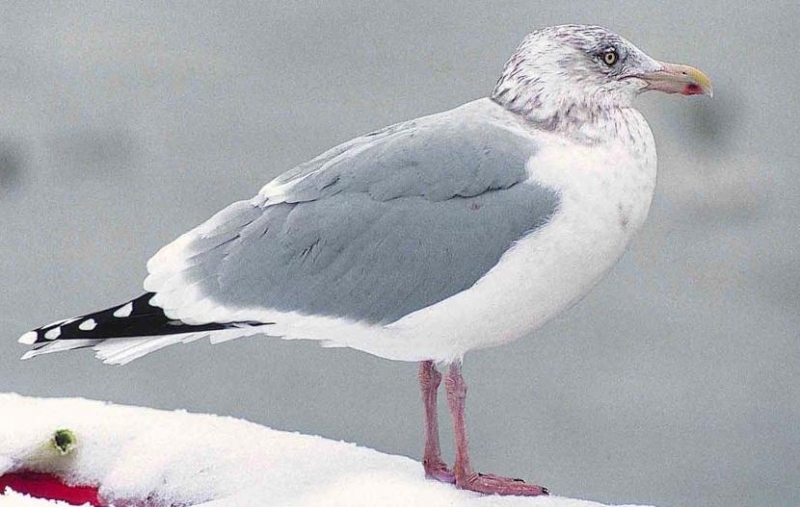 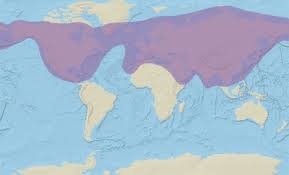 They do not develop the full adult plumage for several years. 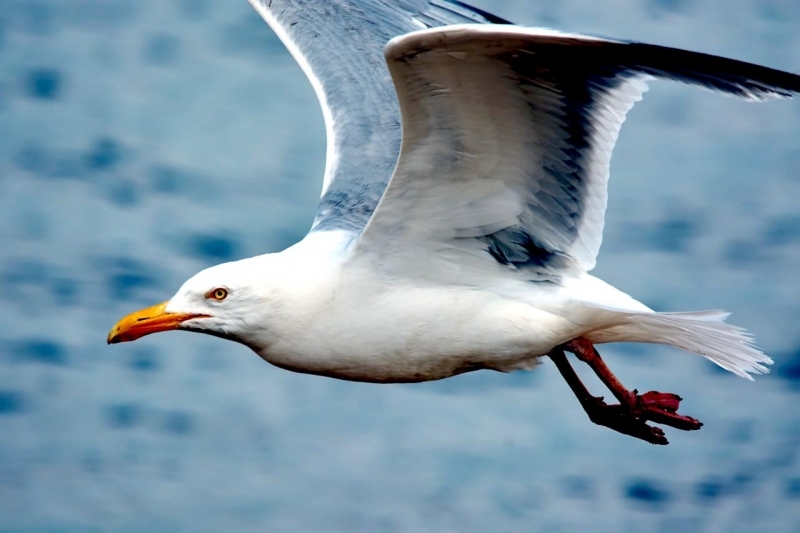 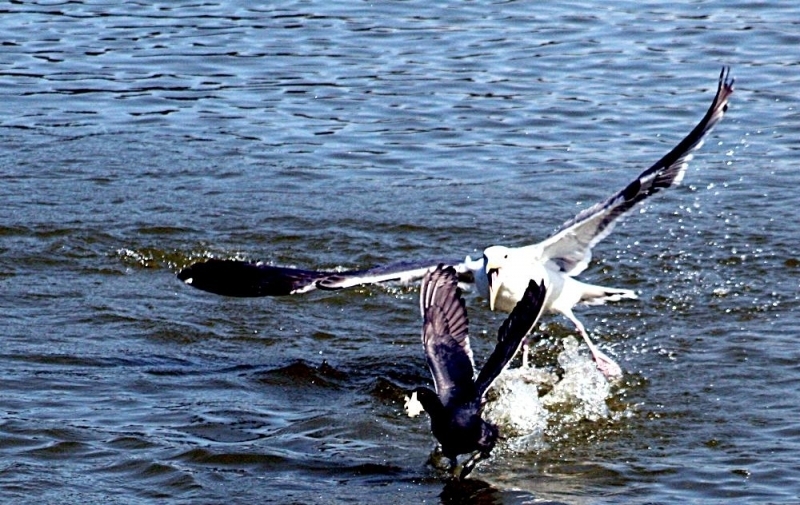 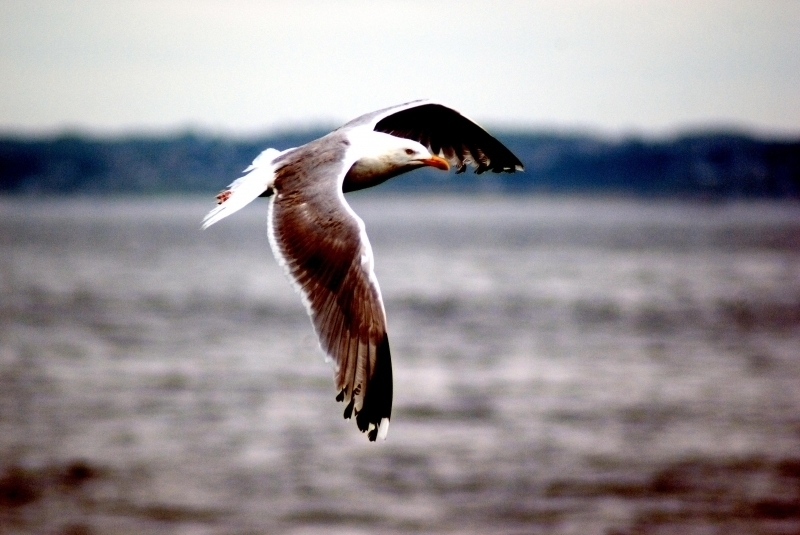 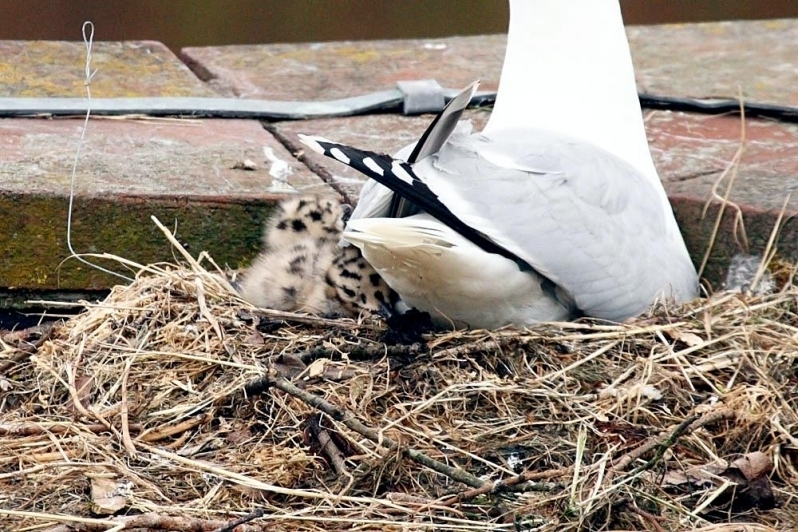 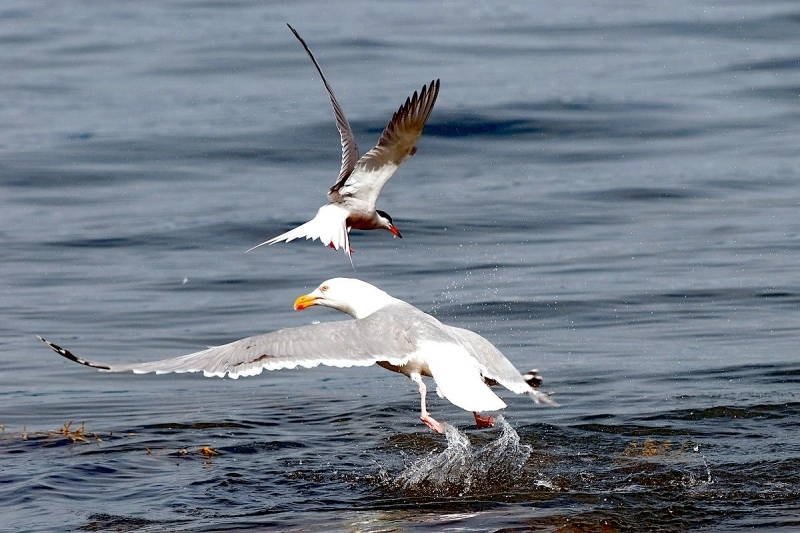 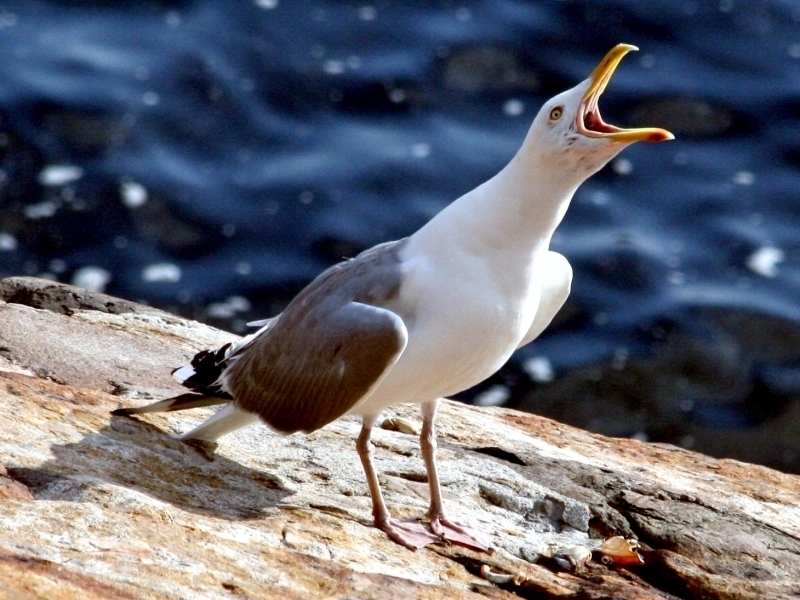 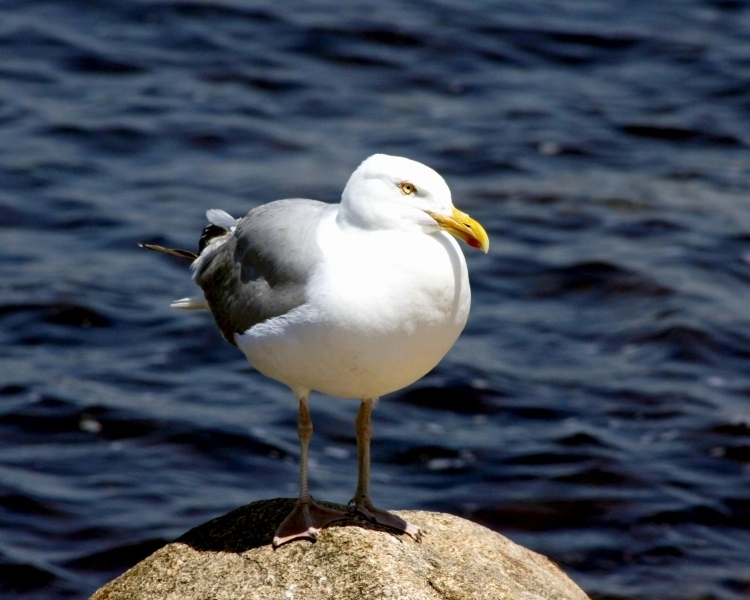 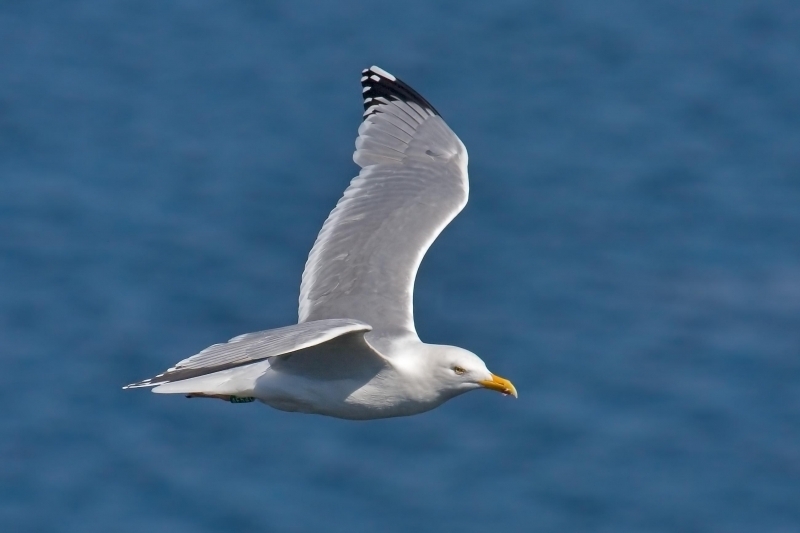 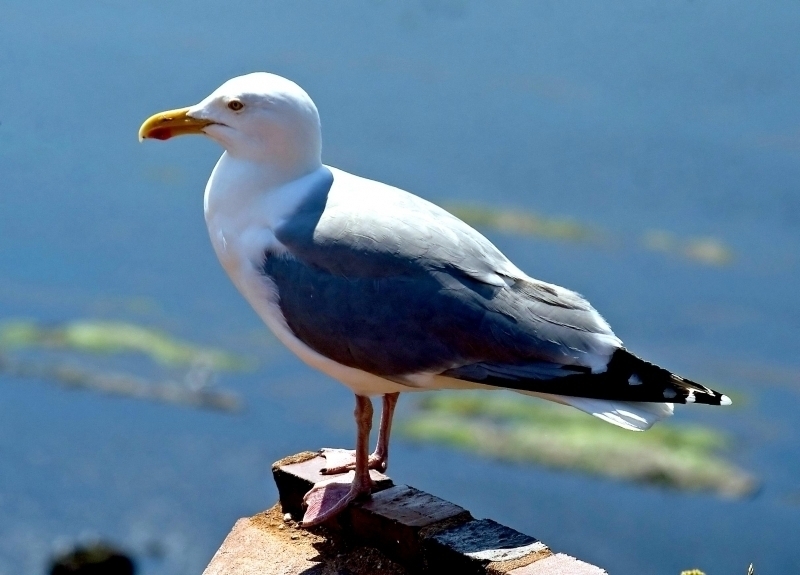 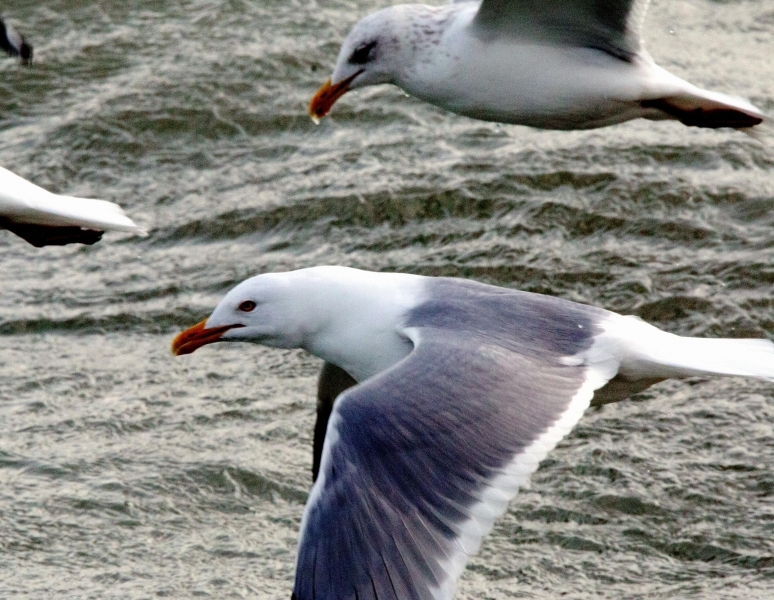 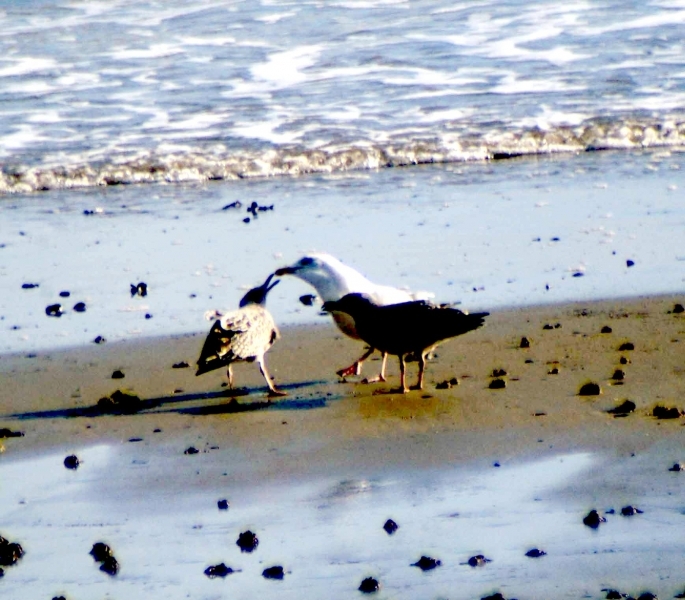 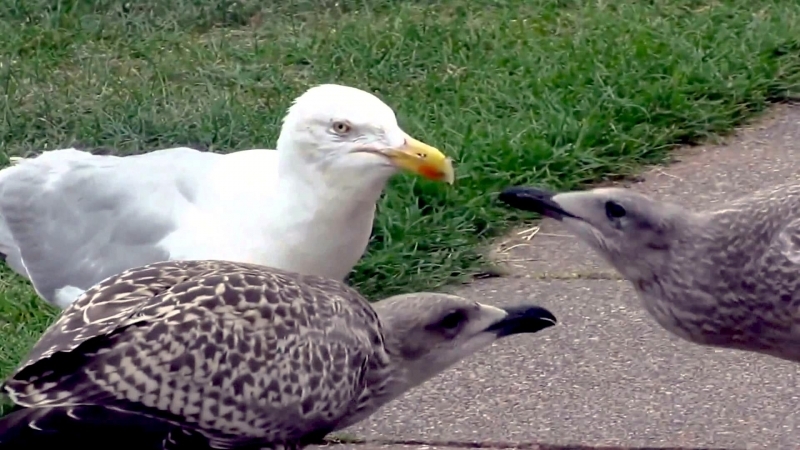 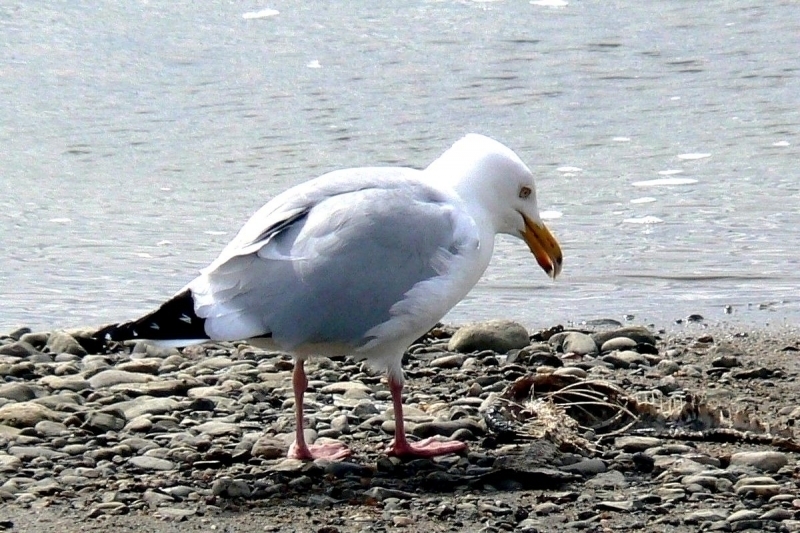 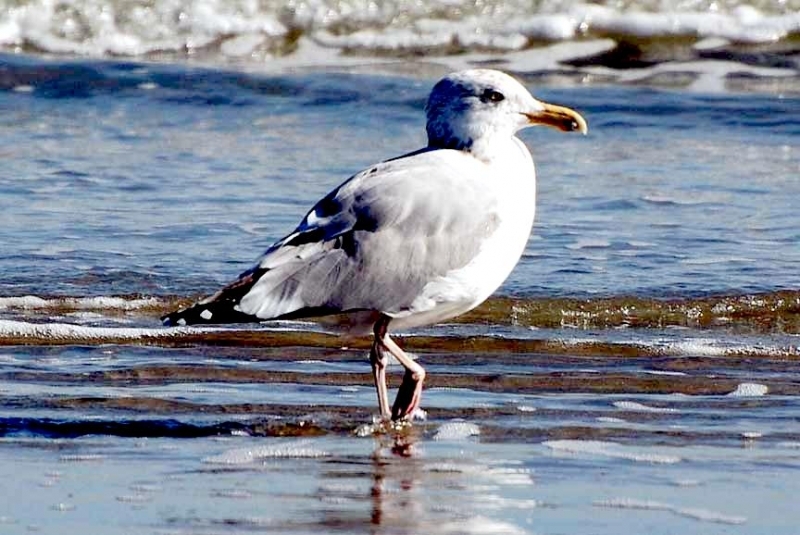 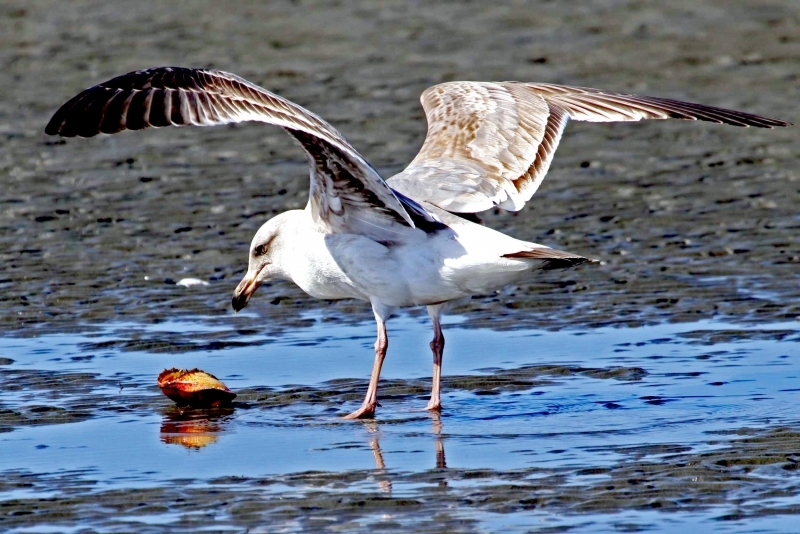 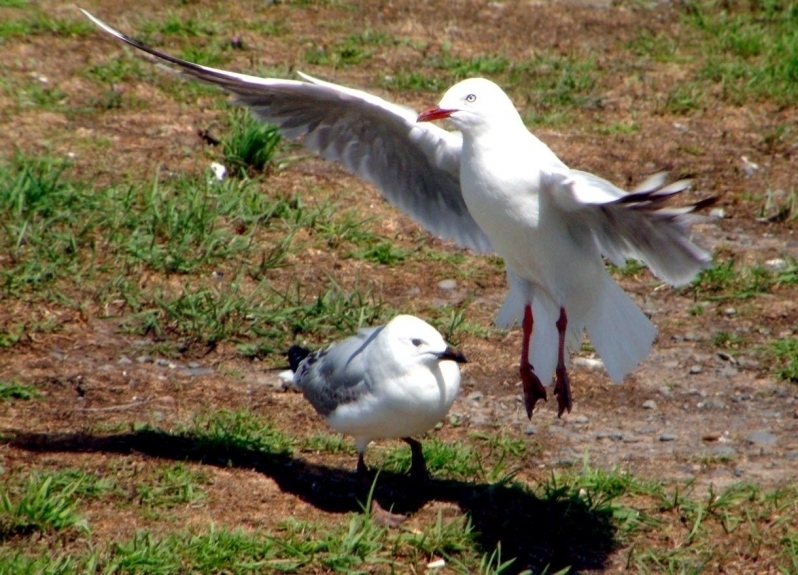 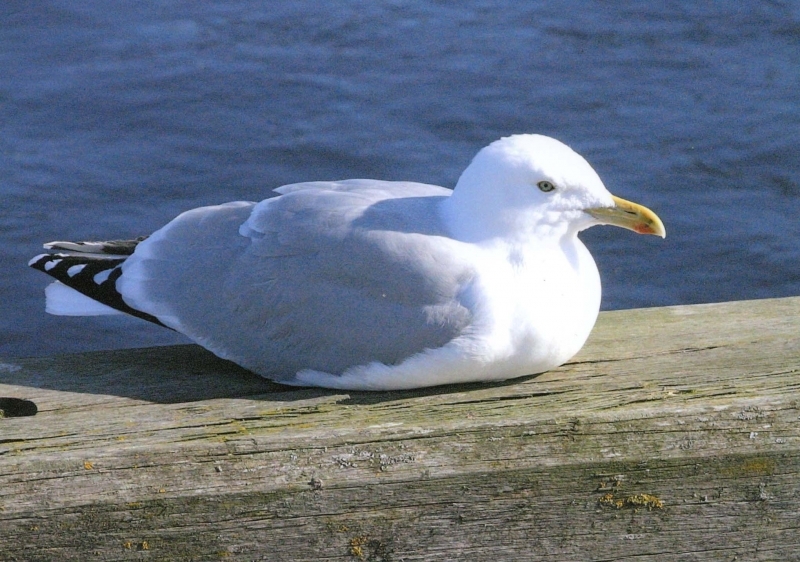 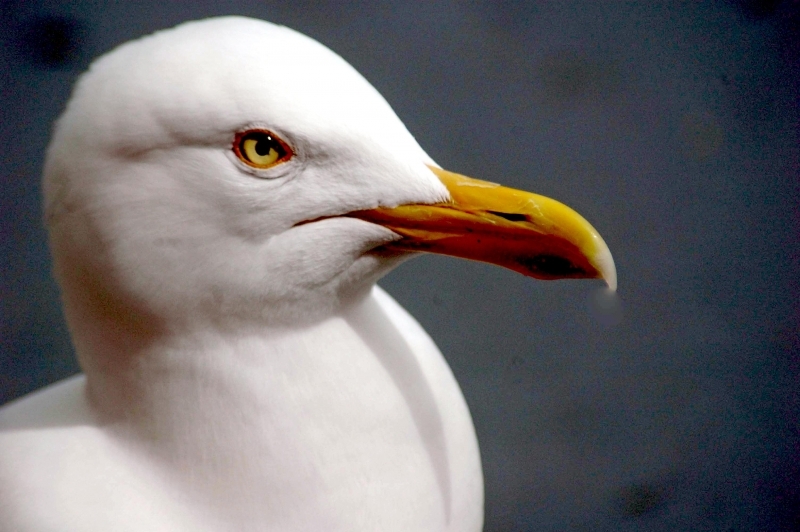 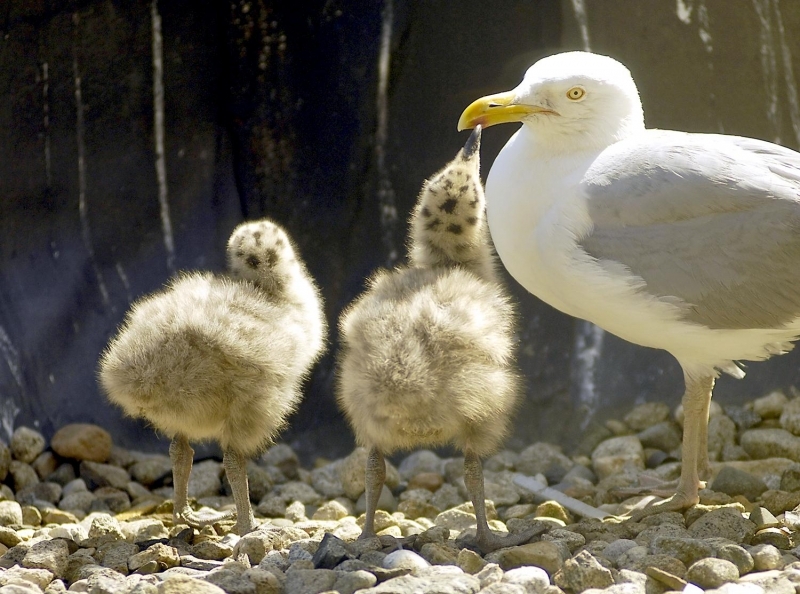 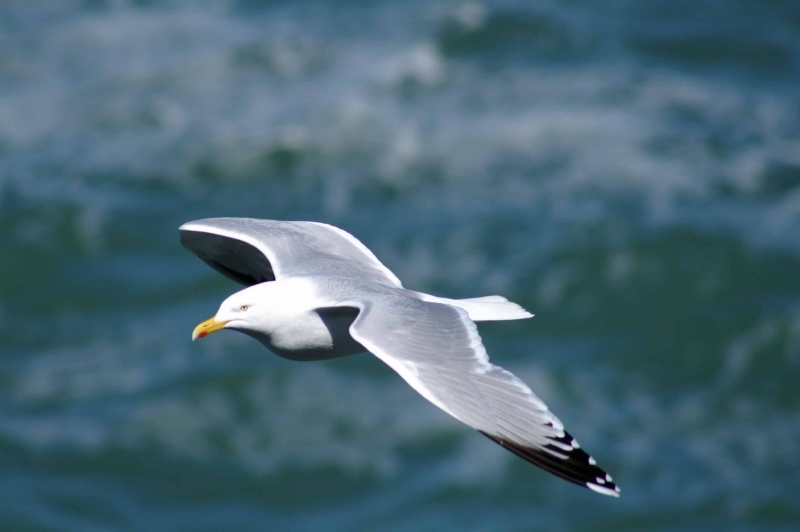 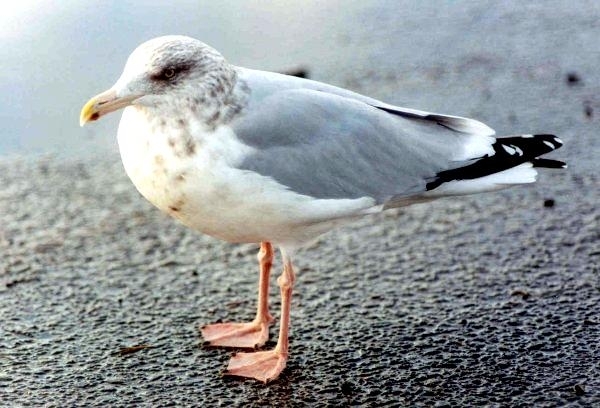 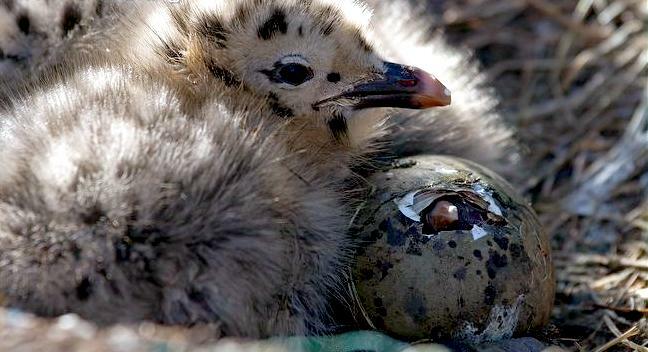 The growing number and size of rubbish dumps and of reservoirs, has encouraged the great increase in the Herring Gull population that has occurred over recent years. 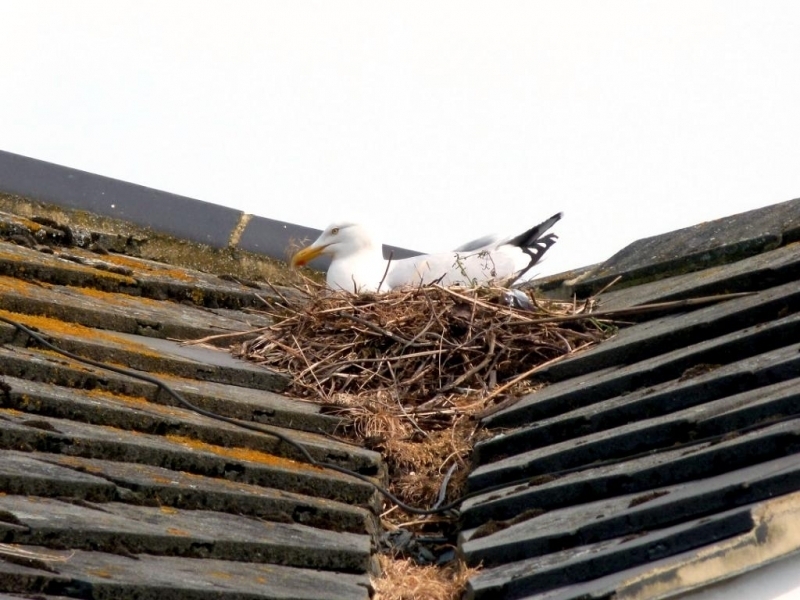 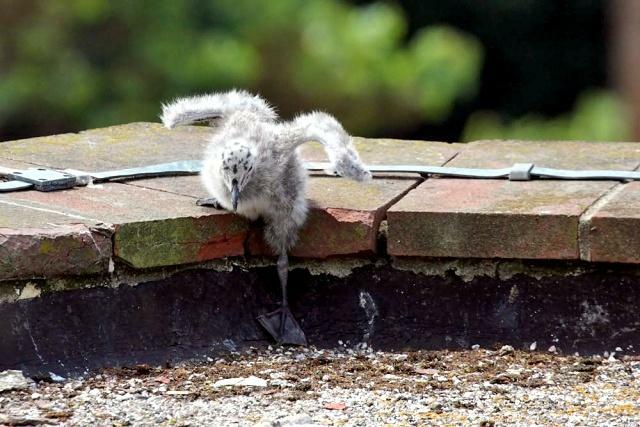 In some areas they have become a major nuisance where expanding colonies have spilled over on to rooftops, causing fouling and noise problems, even frightening people by swooping down and mobbing them. 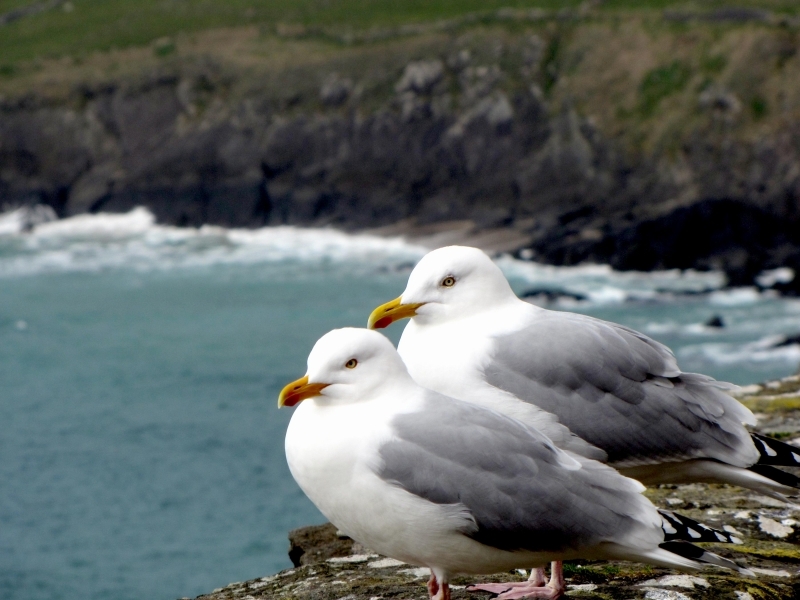 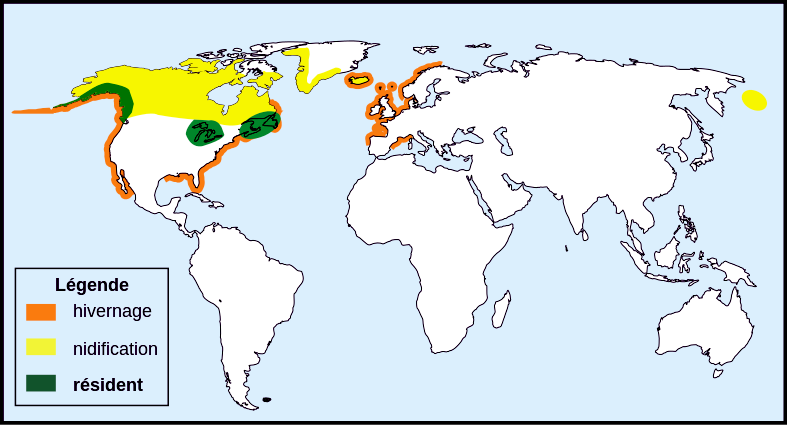 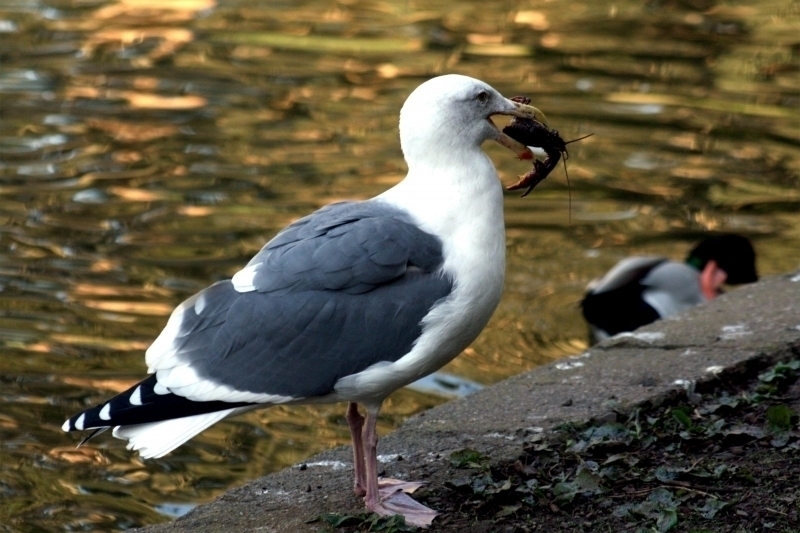 In more natural habitats, Herring Gulls have caused problems for delicate species such as Puffins and Terns. 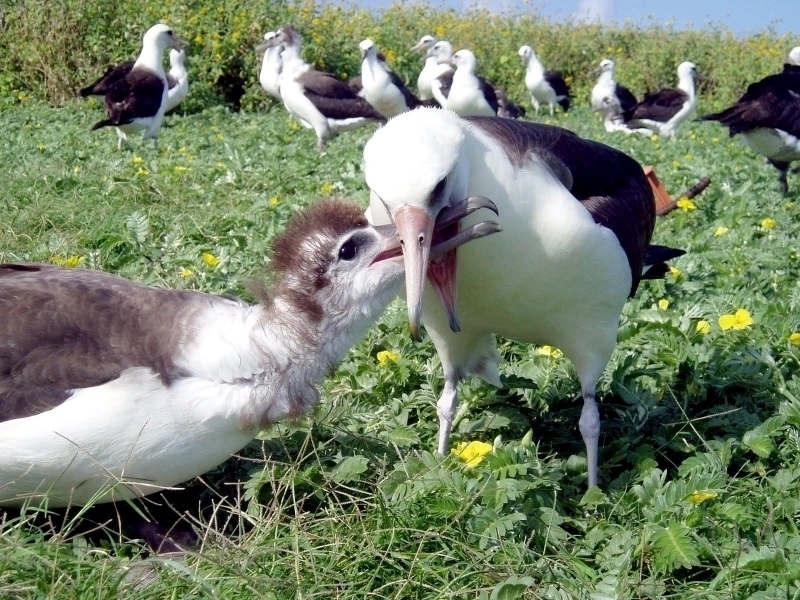 Serious competition for space on cliffs, islands and dunes causes these seabirds to drive other birds away, depriving them of breeding grounds.